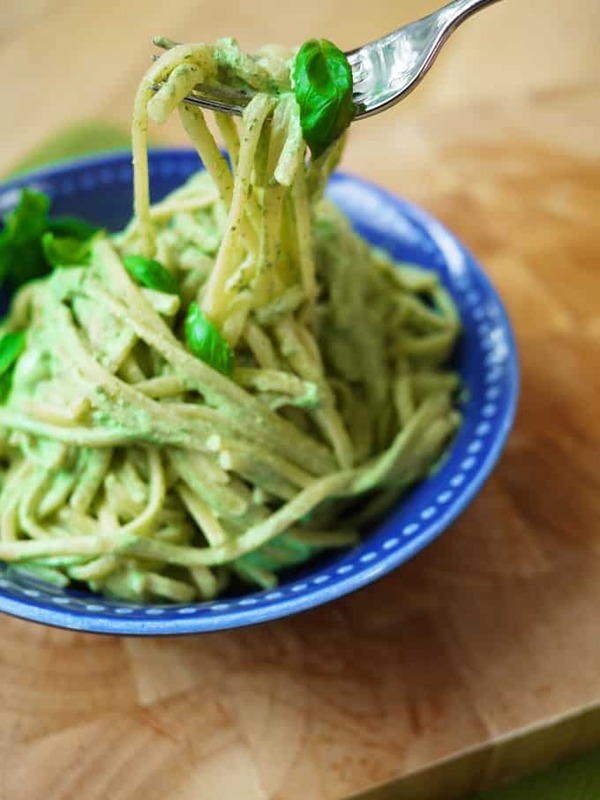 A simple and delicious syn free Slimming World Pesto recipe. The perfect pasta sauce, whizzed up in 2 minutes flat using SW friendly fresh herbs and Quark. This syn free pasta sauce makes the perfect Slimming World Pesto Pasta. 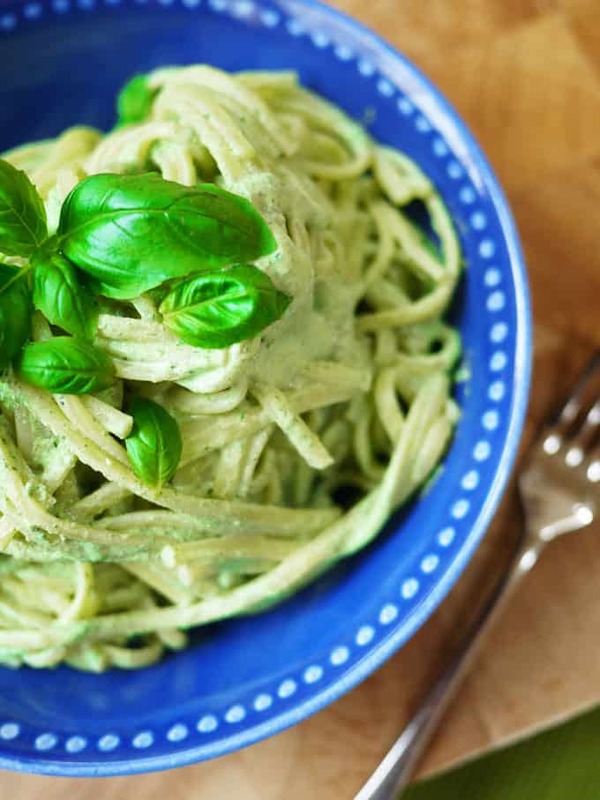 It is a fat free pesto recipe that you’ll come back to time and time again. Add this to your favourite recipes with Quark. 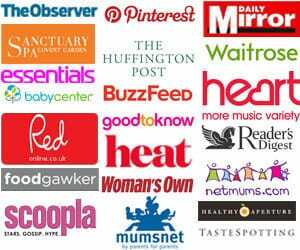 I’ve been following the Slimming World plan on and off (a fair bit of off…) for years. I try to find some balance in life where I can follow the plan and fill up on lots of low fat, high veg meals but also enjoy some of my favourite things. So far I’ve experimented with making Slimming World pasta sauces, Slimming World loaded potato skins and now syn free pesto. This makes the best Slimming World pesto pasta syn free pasta sauce (try saying that with a mouthful of spaghetti!). 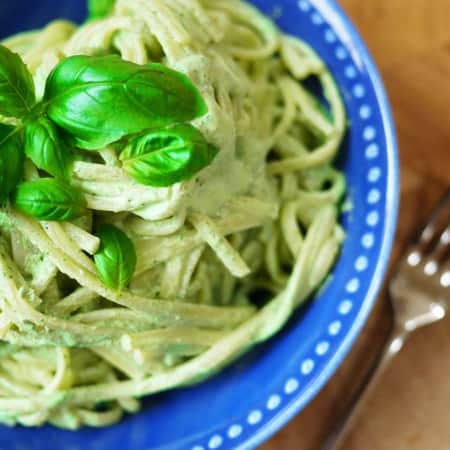 This Slimming World pesto recipe is a real winner in our house. Now, let’s be honest, it’s not going to pass for ‘real’ pesto, but it’s a good imitation if you normally eat pesto like it’s going out of fashion (moi?). It’s pokey enough to pack a real flavour punch (thanks raw garlic!) that somehow keeps me satisfied for much longer than any old bland supper. It’s super quick to make and keeps in the fridge for a few days too. I made mine in my amazing, life changing (honestly this blender is), much loved Froothie. It carries out some kind of magic that whips the Quark into submission and leaves it silky smooth with no herby lumps. Just a creamy, light, fresh sauce. Serve this syn free pasta sauce over hot steaming spaghetti and if you are following Slimming World, throw in some green beans, asparagus or spinach at the end of the cooking time to get your Superfree vegetables quota. 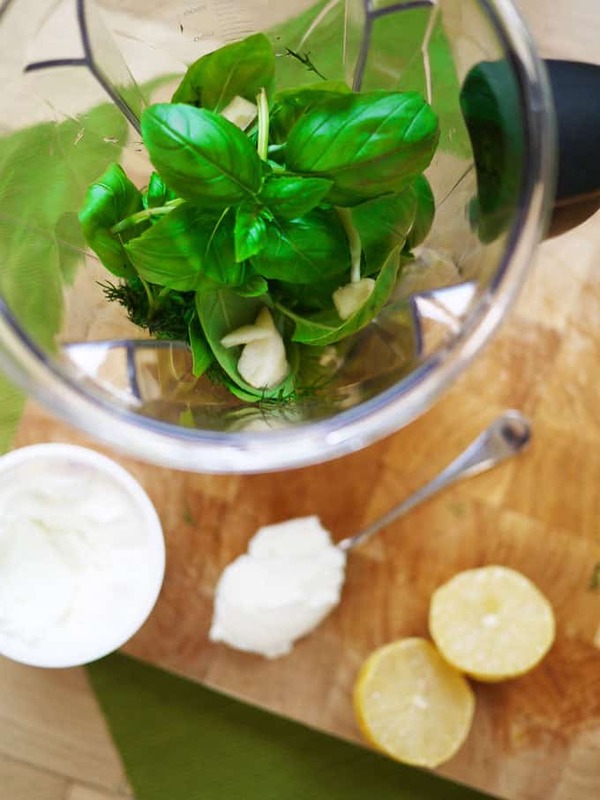 Top Tip for making the Slimming World Pesto Recipe! When using raw garlic, remove that little shoot section inside the middle of each clove. It stops that horrid burpy (sorry) feeling afterwards apparently. Also, you could add your Healthy Extra Parmesan cheese to this but I don’t think it really needs it. A syn free Slimming World Pesto recipe. The perfect pasta sauce, whizzed up in 2 minutes flat using SW friendly fresh herbs and Quark. Blitz everything together until completely smooth. Serve over hot pasta or on grilled meat or fish. Your one pot pasta is one of my go to slimming meals actually. I leave out the oil and add green beans or similar to up the veg a bit. Looks delicious. Can I come round for dinner? Oh wow Sarah, absolutely love this quick and simple dish, do you heat the pasta and quark mixture of just toss together and serve instantly? Must try this as my daughter is spaghetti mad! Oooh I am absolutely loving the sound of this! Gorgeous!! Good luck with the weight loss too. It’s not easy! Sounds delicious! I make something very similar, but I add kale to mine too. Looks so delicious. Pasta and pesto is one of the best meals. Love the flavour, love the colour. Love my froothie blender too. Hi! Thank you for this recipe! I was just wondering how long does it last for in the fridge? And is it freezable? Went down well at our last taster so am giving it another go with gluten free black bean spaghetti. Ahh so pleased to hear that Bob! This loooks yummy. How long does it last in the fridge please?